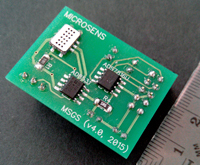 The MGSM Gas Sensing Module provides the necessary circuitry to drive the MSGS 5000i gas sensor, integrated in the module. The sensor output is available in analogue format as well as digital format (SPI). The sensor temperature can be set to a default value or via an external input. The MGSM module can be powered by a 9V battery for short term use or any power supply delivering between 8V and 16V DC.